Based at Laurieton south of Port Macquarie, SCUBA HAVEN services divers in the northernmost section of the mid-north coast. 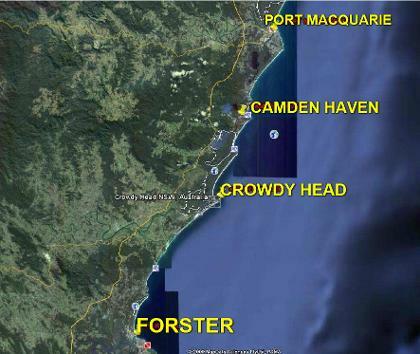 For us southerners, it's about 80kms north of the Forster turnoff. Click on their logo to visit their website. All information is adapted from their website. A must visit just for the available video footage. The Google Pic illustrates the relative distances. The Cod Grounds is a massive reef area off Point Perpendicular. The main pinnacle comes up to 18 m. One side of the pinnacle drops to 26 m and the other around 32 m. With Grey Nurse sharks on it all year round and attracts large schools of Jewfish and king fish. Was the largest working crane in southern Australia. When being transported up the coast she turned upside down and eventually sunk off Point Perpendicular. Now lying on its side upside down in 40m of water it is getting covered with soft sponges and corals. 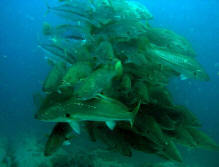 Large jewfish, kingfish and giant cuttlefish are seen there. An area of reef with numerous pinnacles, gutters and bommies. Site ranges from 12m - 30m and attracts grey nurse and whaler sharks. With a bottom of large Gorgonian fans, sea spiders it attacks large school of bait fish, stingrays, morays eels. A rock wall that rises from a depth of 25 meters to 10m With a large cave in the base of the pinnacle around it. It's often home to schools of jewfish, pelagic fish, bait fish and even the rare eastern blue devil. Old Faithful also boasts a large sponge garden that is equally one of the best sponge gardens you will dive anywhere abound with nudibranchs and large starfish. 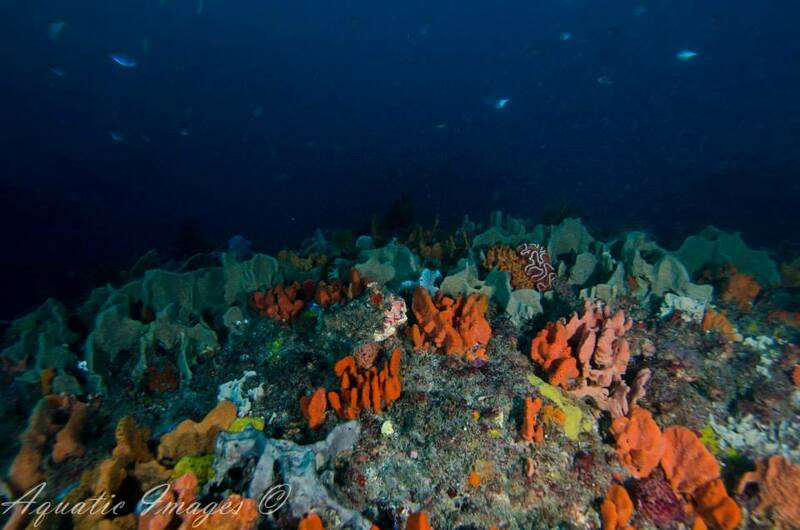 This reef has numerous gutters and bommies all covered with soft and hard corals. A nudibranchs heaven. Attracts sea spiders, large school of bait fish, stingrays, morays eels, blue groper, star fish. This rock wall comes from a depth of 20 meters to 8m. Covered in hard and soft corals of all types making it the best macro dive in the area. This dive site consists of two bommies submersed in 18m of water, joined together by a natural arch. One bommie rises up to 10m, the other to 6m. There are soft corals, sponges, nudibranchs, wobbegongs, PJ 's and a wide variety of marine life. A photographers macro delight, and a dive to relax and enjoy. A great easy dive. Maximum depth of 13m with the rock above the surface, a nice circle around the rock with plenty to look at. For the more adventurous there is a great fly over if there is not too much surge. Marine life is abundant. This dive is popular with the novice and experienced diver. Thirty minutes south of Port Macquarie you will find a rock plateau that rises from 33m of water levelling off at around the 24m mark. A peak rises up further to 12m. This dive is absolutely spectacular when conditions are good. A swim through or two, offer the more daring divers a chance to strut their stuff. 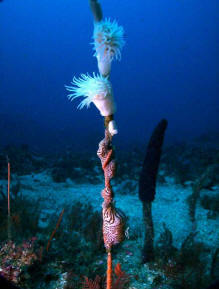 One hundred meters northeast of the main rock you will come across a beautiful sponge garden that is well worth a look. 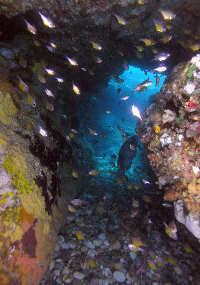 This dive has spectacular rock growth and is one of the best dive sites. Every time you go there, you will see something different. Pelagic fish are a certainty, along with the usual nudibranchs, and other marine life. If dived correctly you should get a good bottom time. This dive site is made up of rock ridges and gutters. The reef itself covers a vast area, but is definitely worth having several dives on to examine it extensively. Marine life is abundant in both fish and plant life. You will find soft and hard corals, sponges, nudibranchs and a wide variety of fish. North of Port Macquarie is a spectacular bay with depth ranging from 8m to 20m with several gutters and a variety of dive sites. The marine life is abundant including turtles, octopus, cuttlefish, wobbegongs, and Grey Nurse Sharks. There is always something to talk about at Barry's Bay.